1. Select the roof windwalls and check to see the orientation of the windwall local axes. 2. 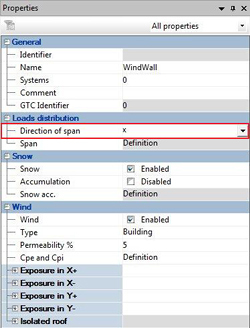 Taking the direction of the local axes into account define the windwall span direction in the properties window. The span direction should be perpendicular to the load bearing (supporting) elements. 3. 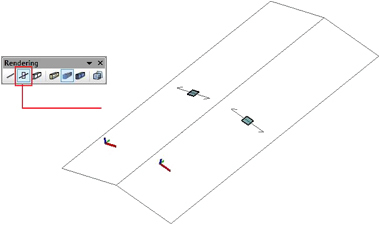 To view the span direction on the windwalls, choose the axis rendering representation of the structure. 4. 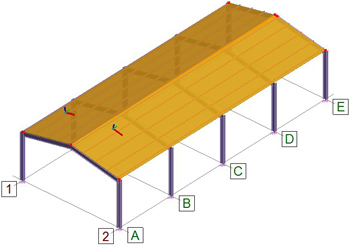 After meshing the structure, the planar loads charging the windwalls are automatically distributed to the purlins, which are the load bearing elements.